BHU MBBS Counselling 2017(बनारस हिन्दू यूनिवर्सिटी मेडिकल काउंसलिंग)is going to be conducted tentatively in the month of July 2017. The BHU MBBS BDS counselling will be conducted after the releasing of merit list in NEET 2017 by Institute of Medical Sciences, Banaras Hindu University (IMS BHU). During the process of BHU MBBS admission, 85% State quote seats will be held by IMS BHU and the remaining 15% All India Quota seats will be done by Medical Counselling Committee (MCC). All the eligible candidates must attend BHU MBBS Counselling Schedule 2017 in person as per specified date and time. Through BHU PMT Counselling, candidates will be allocated the seats in UG medical and dental courses offered by IMS. All the eligible candidates will be called for IMS BHU MBBS Counselling 2017 on the basis of BHU MBBS Merit List declared in NEET 2017 results by IMS BHU. The counselling session will be conducted for offering admission to 84 MBBS seats and 50 BDS seats in IMS BHU. Candidates must keep track of BHU MBBS important dates to remain updated about the counselling process. Check details below. 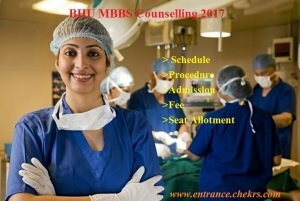 BHU MBBS 2017 Counselling is going to be conducted in two rounds. Candidates must register themseleves for attending the counselling through its official website. Candidates will be allocated the seat as per the order of the rank secured and availability of the seat. Candidates belonging to reserved category must produce the necessary certificates during the counselling. At the time of counselling candidates must present all the certificate and necessary document for the purpose verification. Candidates must submit the notarized Bond on a Non-judicial Stamp Paper, and make confirmation that he/she will complete the course and will not leave it in between. If any candidate wishes to discontinue the course in between before the last date of admission, then they must pay a sum of Rs. 25000 via Demand Draft to Director, Institute of Medical Sciences, BHU. Scheduled Tribe (ST)/ Scheduled Caste(SC) candidate will need to pay Rs. 5000. Apart from this, if any candidate desires to leave the courses after admission or any time till the completion of course, then he/she must make payment of Rs. 300000 via DD to the Director, Institute of Medical Sciences, BHU. Here SC/ST candidates need to pay Rs. 75000. After the successful conduction of BHU MBBS BDS Counselling 2017, all the eligible applicants will be alloted their respective seats upon merit basis through BHU MBBS Seat Matrix. At the time of counselling after going through subsequent process applicants will be allocated BHU MBBS seat on the basis of the category to which the candidate belongs and as per BHU MBBS Merit list. Upon declaration of BHU MBBS Counselling Results, we will also update you here with the same. For more updates on Medical Admission bookmark our page and you also get the benefit of getting frequent alerts on Upcoming Engineering UG Exams.